When you are facing a criminal charge, nothing about the process feels fun. Whether the charge is for a minor offense or you are facing felony charges, our team is here to help you every step of the way. When you need a criminal defense attorney in Bend who will fight aggressively for your rights, reach out to the team at Donahue Law Firm. We will work with you from the very first day you are arrested or receive a charge to the final conclusion of your case. 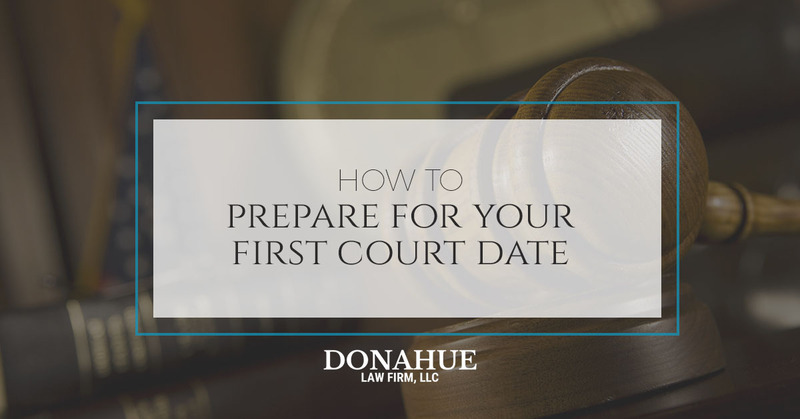 When you are facing your court date, we encourage you to follow these tips to ensure you are prepared for the day ahead. While it is not necessary to go out and buy a three piece suit for your court date, you do want to put your best foot forward at your hearing. For men, try to dress in nice slacks and button up shirt. If you don’t own any button up shirts, opt for a polo or other dressy-casual shirt. For women, look for something that is modest and not showy. A simple skirt or nice slacks paired with a solid colored top will create a professional appearance. Dressing nice will demonstrate to the judge and everyone else in the court that you are taking the hearing seriously. If you show up in sweats and a hoodie, you may come across as if you think the entire ordeal is a joke. While you do want to dress professionally, make sure what you wear is still comfortable. You may be spending an extended period of time at the courthouse and feeling uncomfortable will make an already less than ideal situation even more difficult to handle. When in doubt about your outfit, ask for a second opinion from your friend or family member to make sure what you are wearing is court-appropriate. While you may feel like you are facing the courts unjustly, it is important that when you show up to court you are in a calm state of mind. Throwing a hysterical fit in front of a judge will not get you what you want in the long run and can result in further charges or an unfavorable view of you by the jury. If you find comfort in listening to music or going for a long walk, schedule out some time before your court appearance to do so. Make sure that when you enter the building, you are cool and composed. Showing respect to everyone you interact with in the court building will go a long way in painting you in a good light. Make sure that every time you are asked a question, you respond clearly and politely. Becoming outraged, rambling incoherently, or making snide remarks can all count against you in the court of law. Make sure you practice your classic manners, such as please and thank-you, and keep your answers short and to the point. The worst thing you can do is try to face the court of law alone. Make sure you have a trusted criminal defense lawyer on your side before your first day of court ever arrives. A lawyer will have the years of knowledge it takes to navigate the complex legal waters. Just because you are innocent, doesn’t mean you will leave the court unscathed. To ensure you have the best chance possible at receiving a fair sentence, you need a criminal defense attorney on your side that can prepare you for the court date. Not only can this help you find a better outcome, it can lower your stress greatly as you know you have someone fighting by your side. A proven track record: Talk to your potential attorney about what cases they have handled in the past and what tactics they used to help their clients win. Clear communication from day one: Make sure that from the very first consultation forward the attorney you choose communicates clearly with you and on a consistent basis. You should never be left hanging and wondering what your attorney is up to. Someone who will fight aggressively: The court system is no cake-walk and you can’t fight a battle passively. Make sure that you have an attorney who fights for your rights and does so with gusto and spark. When you choose a criminal defense lawyer to help you create the best case possible, make sure you listen to their advice and coaching. They have been in the court system countless times before and have likely faced scenarios similar to yours. When they offer you a plan of action, make sure you follow it. Don’t surprise your lawyer in the courtroom with new information or a different approach than previously agreed upon. Remember, a good criminal defense attorney is there with your best interests in mind. They need to know everything about your case in order to have the best shot at achieving victory for you. Depending on what charges you are facing and what the circumstances were leading up to your arrest, your first day in court might be an intense experience. Prosecutors will work hard to intimidate you and bully you into answering questions the way they want. Make sure you remain calm and remind yourself that you have a professional fighting by your side. Don’t allow fear tactics to sway you from your stance. When you need someone who is well versed in criminal defense law in Bend, you need the team at Donahue Law Firm. We fight for our clients rights and we won’t back down in court. If you are nervous about an upcoming court date, reach out to our team right away. The sooner you receive legal counsel the better, so we can start building a case for your defense. No matter what charges you are facing, our criminal defense law firm is here to help. Call today.